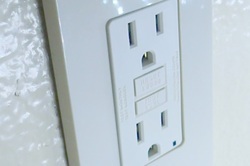 >Ground Fault Circuit-Interrupters (GFCIs), they are the little outlets with the buttons found in your kitchen or bathroom. A lot of older buildings, if they’re not up to code, will not have them. Where should they be installed in your house or apartment? A big concern for all our owners is decreasing their plumbing costs, and the best way that we have found is prevention. A lot of it can be educating the tenants on how to treat the pipes with care. For example, we encourage tenants to clear their drains every so often with bleach, and ask them not to put certain types of food or grease down their disposals. A lot of buildings also are dealing with old or outdated galvanized pipes and fixtures. Replacing the bad parts of the pipes or completely upgrading the pipes to copper and PVC piping is a good way of decreasing plumbing costs in the long term, though in the short term the cost will be higher. But there is a lot of property damage that can occur if your plumbing is not in good shape. Since that damage can come from leaks or pipes bursting, we also recommend checking that all angle stops and supply lines and any faucets or fixtures that are leaking are in working order. A simple thing like replacing the angle stops & supply lines is a great preventative measure. However, the best long term solution is to do regular cleaning of the lines. Hydrojetting on an annual basis and doing camera inspections of the pipes is a way to do that. Hydro-jetting is the ultimate technique for cleaning drains. The plumber injects the pipe with a high pressure water stream that cleans out all debris completely, leaving the pipe clear for water to flow through it without obstruction. Traditional snake-type drain cleaners break up the debris, which can re-clog further down the line, but the jet of water removes it completely. It also prevents self-healing clogs of substances such as grease from re-forming if some material remains. All of these are capable of leaving residue behind after they are broken up, which is often left caked to the sides of the drain. It’s impossible for the snake to reach the walls of the pipe, so the residue remains there for additional material to cling to, causing future blockages. The high power jet of water blasts the residue out, either at the same time as the debris or shortly after it has cleared the initial blockage. Cleaning drains can be a risky business, because many of the homes have aging infrastructure and pipes that are rusted and could do with replacement. However, when your drains are blocked all you want is to remove the clog, preferably without damaging the pipe. Hydro-jet cleaning uses a pulse flow, which allows the hose more maneuverability inside the pipes. This enables the plumber to target the site of the blockage and by-pass areas that may be vulnerable to damage, and is particularly useful for moving around tree-roots when those are the reason for the clog. Bacteria that settle in your drains cause an endless array of problems. From harboring disease through to causing foul odors, bacteria are responsible for many issues. The hydro-jet method of drain cleaning removes all bacteria and leaves the drain pipes squeaky clean and fresh. If you’re experiencing odd smells coming from your drains, there’s a strong possibility that hydro-jet cleaning will make a huge difference. The greatest benefit of using hydro-jet cleaning for your drains is the financial benefit. This method of cleaning gets the drains so completely clear and fresh, that a once a year cleaning goes a long way. After cleaning the pipes with a high pressure water stream, your plumber can conduct a camera inspection of the pipes to make sure they are completely clear. This type of detailed cleaning secures your pipes against clogs and saves you money on drain cleaning in the long term. water calculator: How much do you use? This website offers a water calculator to determine what your water usage is in your home, compared to other homes in your zip code, and then suggests ways to conserve water. Make sure your faucets don’t drip or leak. Faucet water use accounts for 15-18% of the overall water consumption inside the typical household of four persons. An average American household of 3 uses between 18.1 and 26.7 gallons per day for all faucets (bathroom, kitchen, and utility sink). This amounts to between 6,600 and 9,750 gallons per household per year for faucet use. The main difference between a house that uses 9,750 gallons and 6,600 gallons per year is the flow rate of installed faucet aerators. 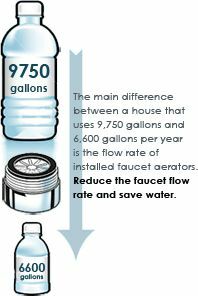 Reduce the faucet flow rate; save water. The aerator (the screw-on tip of the faucet nozzle) restricts the maximum flow rate of water from the faucet. New kitchen faucets are usually equipped with a 2.2 gpm aerator. Bathroom faucets can have aerators that restrict flow to 1.5, 1.2, 1.0, or 0.5 gallons per minute (gpm). Basic bathroom faucet aerators start at about $1 each and prices go up depending on the features you select. Because hot water is frequently drawn from faucets, reducing flows also reduces hot water use which means energy savings. A basic bathroom faucet aerator is inexpensive and one of the most cost-effective water efficiency measures. It is always a good idea to bring your old aerator (and any associated washers) to the store with you when you purchase a new one to ensure that the new aerator will fit on your faucet fixture. The water, wastewater, and energy saving benefits you get from installing new faucet aerators is primarily determined by your current aerators. But since faucet aerators are cheap and the water savings are well documented, it’s a safe bet that you will pay for your aerator investment in less than two years. Reducing the faucet flow rate in the kitchen below 2.2 gpm is easily accomplished by replacing the aerator, but the water savings may be somewhat limited. Many faucet uses in the kitchen are not discretionary. For example, filling a pot with water to make pasta. Regardless of the faucet flow rate, the volume of water needed to fill the pot is the same. Reducing the flow rate of the kitchen faucet saves water and energy, but also results in longer wait times to fill fixed volumes and can also reduce effectiveness for hand-washing to dishes.